Main Entrance - All photos by Jim Mason This National Urban Wildlife Sanctuary, operated by the Hutchinson Recreation Commission, is a demonstration area for attracting wildlife to urban settings. 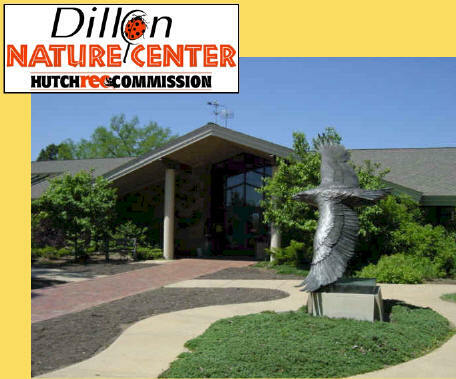 The Education and Discovery Center contains exhibits, a nature library, class and meeting rooms, and a gift shop. give visitors many ideas on attracting wildlife to their yards. 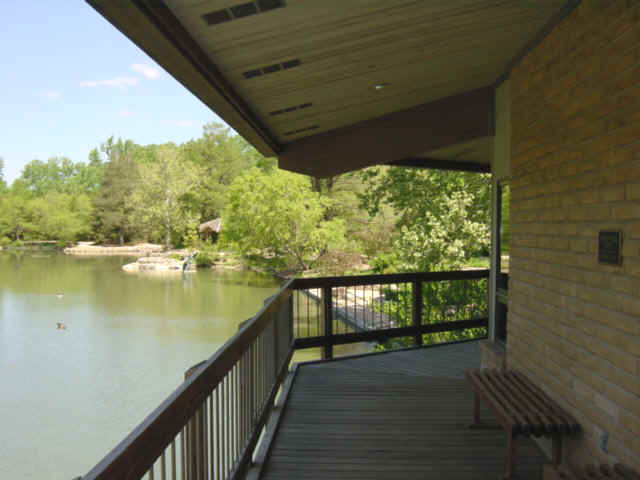 A deck on the back side of the nature center overlooks the pond and adjacent gardens. 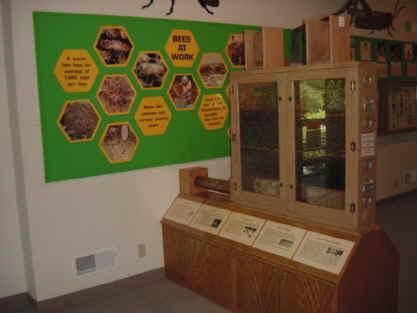 One of the interior display is a viewable beehive. There are also many small terraria and aquaria and hands-on displays. In the center of the exhibit area is a floor-to-ceiling open diorama depicting a prairie hillside topped by a tree. The 100+ acre tract is a wild arboretum with hundreds of species of trees, shrubs, vines, grasses, and wildflowers. Trails wind through woods and prairies and by ponds and marshes. Bullfrogs, leopard frogs, sliders, and painted turtles can be viewed around the water. Also watch for Canada geese, pied-billed grebes, green herons, wood ducks, and spotted sandpipers. Interesting snakes of the area include the common garter, coachwhip, prairie kingsnake, and western hognose. Coyotes, foxes, cottontail rabbits, and white-tailed deer are often sighted. Mourning doves, yellow-billed cuckoos, great homed owls, common nighthawks, and several species of swallows, woodpeckers, and warblers can be seen at various seasons. Ospreys fish the ponds in October, and house finches, American goldfinches, and black-capped chickadees are at the feeding stations in winter. Picnic tables, Visitor Center, Restroom. Three miles of developed trails. 1/3 mile is wheelchair accessible. In Hutchinson take K-61 north to 30th Avenue. 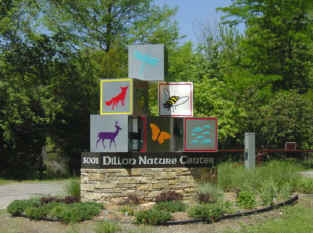 Dillon Nature Center is located less than a block east on 30th Avenue.